As I sit here writing there are small snowflakes coming down outside my window. It is only early April and I am already daydreaming about long summer days. 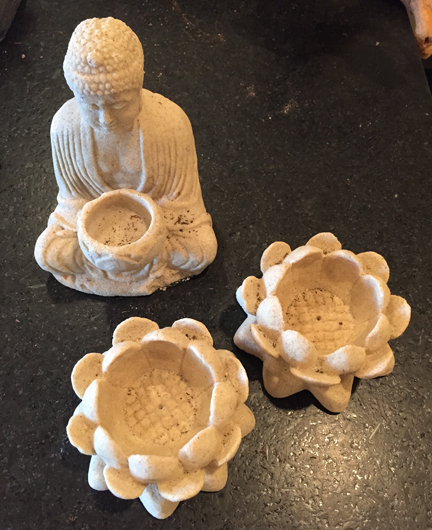 Setting up the patio for summer entertaining is still weeks away but I am getting a jumpstart on indoor gardening that can transition to the patio once the warm weather arrives. We recently asked our friend and style maven [with a green thumb], Anne Livingston, to show us how she creates her beautiful and unusual succulent and cacti arrangements. I spent an afternoon with Anne and learned a few of her tips for creating and caring for low water plants. They are easy to make and much more interesting than picking up a potted plant at the nursery. Follow her quick and easy steps below to create your own! ABOVE: TRIPOD PLANTER [ACQUIRED AT A BEAD SHOP THAT WAS CLOSING ] WITH NEWLY REFRESHED SUCCULENTS AND OBJECTS. AFTER A SUMMER ON OUR SOUTHERN FACING DECK. "I SLIDE THIS TRIPOD PLANTER INTO OUR DINING ROOM WHERE IT ASSUMES A SCULPTURAL ROLE". Visit junk stores, antique stores and garage sales for unique finds. Don't settle for what you can find at the local gardening store. Think clear glass or old containers that can be repurposed. What objects would you enjoy seeing on your table or on your patio? Often it is the unexpected container that enhances the arrangement. Also consider bowls or dishes that are interesting and fit your mood or style: modern, natural, traditional, vintage and don't be afraid to mix it up a little. • Height: some succulents are low growers and can be placed in the front while the taller, more upright growers should be positioned near the back of the pot to create height and layering. 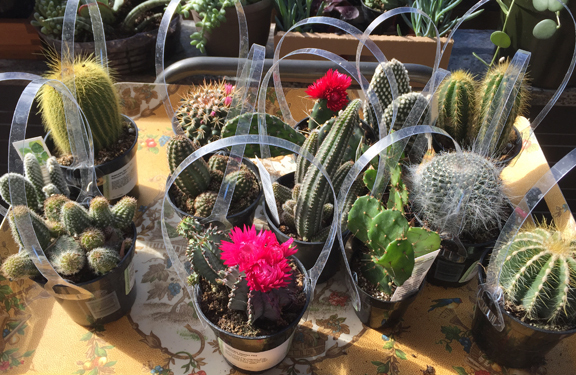 Ask your local gardening store to point you to the best soil for succulents and cacti. These plants like to have well drained soil and they do not do well in standing water. If you have a deep vessel for planting you can build it up with stones then add planting soil. Once you have the plants arranged the way you like them you can easily drop them into the dirt as they do not have deep roots. Once all roots are covered with soil you can add a top layer of white sand or pebbles to complete the look. Good news—these plants do not like a lot of water. Drop ice cubes where you can on the soil to water every week or two. This is much more efficient and keeps the plants from getting over watered. Keep in mind that succulents and cacti have different watering requirements. Read the sun and water requirements for each and you may want to plant the succulents in a separate container than the cacti to help manage both better. Overwatering, resulting in root rot, is the most common mistake with succulents and cacti, and using a vessel without drainage is more likely to have that result. Sometimes if I'm modifying a vessel not intended for this use, I will drill holes at the bottom to ensure drainage. The other "Cheat " with succulents is that they will actually tell you if they are getting under-watered by becoming dimpled. Depending on the variety, their leaves act as cisterns—If they're thirsty. Suffice it to say less water is best versus overwatering. 7. Sun, Sun and More Sun! It goes without saying that succulents and cacti need lots of sunlight and indirect sun is fine. Bear in mind, my dining room with a 20 foot awning outside is ANYTHING but direct, yet does the job for 6 to 8 months of the year when temps are too cold outside. The main thing I want you to remember is to have fun with this project and let it be an extension of your taste and sense of humor. They also make really great gifts. Thank you for sharing this with us Anne! and we will add them to our facebook page. Happy planting! Several years ago I had the pleasure of attending a production in the Paris Opera House. Sadly, I cannot remember the name of the opera I saw that evening but I was struck by the luminescent, and ethereal paper sculptures that were perched on either end of the large scale counters in the lobby. It just so happened that over the next few days I would see the unique sculptures again in shop windows and in a gallery in downtown Paris. They were so lovely that I had to know more. The award-winning artist team Sophie Mouton-Perrat and Frédéric Guibrunet have worked with paper for over a decade—each in their own way. They met in 2007 and by 2008 they were collaborating on "common creations, lighting sculptures, diaphanous and light." Sophie attended art school and began working with paper by folding it and creating in paper mâché. Frédéric graduated with a degree in chemistry and is self-taught in paper-making. He has traveled extensively in Europe, Asia and the United States to find the best techniques. He works only in white. To create the Mademoiselle series (see photos above) Frédéric develops the lower part while Sophie shapes the top, figurative part. It is a true collaboration of talent and skill. "He structured the paper, she poetized it. And there was born the union of two beings of paper. and respect for the pleasure of their buyers." PAPIER À ÊTRES® is featured along with other artists in this beautiful book. Click on the Title below to see a preview and where to get it! Thank you Sophie & Frédéric for sharing your beautiful and inspiring work with us. We are huge fans and are daydreaming about a life size piece in our homes one day! What began as my simple inquiry for a table top sculpture has developed into a complete fascination—bordering on obsession! Norman Cherner above with contemporary versions of his chairs produced today by his sons. The Artist at Work, Cover of the Saturday Evening Post 1961 by Norman Rockwell. Note the Cherner armchair. One look at a Cherner chair and you want to know more. The unique shape combined with built-up layers of veneered plywood led me to adopt these modernist and sculptural pieces into my home to accompany a Saarinen table, nearly a decade ago. I love the design, the finish and the "sit"— never once regretting the decision. However, my dining table and chairs purchased at an undisclosed mass retailer—with the intention of being able to seat large dinner parties—was a huge mistake. I chose function and practicality over style and aesthetics—regretting the decision ever since. I share this with you so you can be a much wiser shopper than I was that day! Molded plywood chairs were initially explored by modernist designers rebelling against ornamentation of the past while looking for new materials and processes. Norman Cherner (1920-1987) was an architect interested in affordable housing—designing prefab homes. He was also an instructor at the MOMA in New York in the late 1940s and a published author among other accolades. Cherner originally designed his famous molded plywood chair for a company called Plycraft who later told him that they had decided to not follow through with the project. Plycraft went on to produce the chair, insisting they had designed it. Eventually Norman Cherner sued them for payment and won royalties. Plycraft discontinued the chair in the 1970s leaving it only to be seen in design museums or happened upon in thrift stores. In 1999 Cherner's sons, Benjamin and Thomas started the Cherner Chair Company after years of requests by fellow architects. Using their fathers original specifications the Cherner chair was reintroduced to an audience enamored with modernist design, art and artifacts. I recently found quite a few Cherner Chairs on one of our favorite sites, 1st Dibs. If you are a purist and want the originals from the 1950s-60s this is the place to find them. Here, here and here. Otherwise you can purchase them new at DWR. for appreciating chairs as craft, sculpture, as pure form". Red is the hero in this fabulous interior at Talisker Club in Deer Valley, Utah. I love how the red club chairs create a cozy spot to relax in front of the large-scale fireplace. Pendleton-inspired fabrics with red accents are used on the small stools that nest together to form a bench. As it gets cooler in Utah, the warmth and design of this room make for a great hang out on a snowy day. For those of you who live in warmer climates think about adding red on your front porch to create an inviting feel at the front door. I love how my style-savvy, sister-in-law, Kelly put together this charming rocking chair with a modern print on the pillow and rug. Well done Kelly! Talented Saxophonist and Vocalist George Gregory bringing his jazz vibe to the party. Truly, there is nothing better than spending time with good friends. Mix in great food, a mountain setting, tea lights, jazz music, a hostess who loves to entertain and you have the perfect summer evening. Recently our friend, Janet, and hubby held a patio party at their mountain retreat at 8000 feet elevation. Everything from the food to the decor was beautiful and I especially loved her choice of Indian Summer colors: oranges, yellows, and golds. Above: one of several steel planters that the homeowners rusted, by drenching in a vinegar solution, sits at the entry while a young girl played next to the water feature. Just below: Colorful pillows, tablecloths and sunflowers brighten up neutral backgrounds of stone and textiles. As dusk settled in– paper lanterns lit the steps from the driveway to the patio party below. Although there was a quite large guest list, and couches to accommodate everyone, I loved the intimate dining option of the bar height tables which were draped in cheerful orange, with turquoise sashes and bouquets of sunflowers. Colored glass and votives were placed throughout the patio and on tables adding light and warmth as the sun began to set . Thank you to all of you who entered our Robert Siegel Porcelain Vase set drawing and giveaway! There was a great amount of interest in the vases and we hope you enjoyed seeing his work! He is a huge talent. We both loved reading the comments and seeing everyone's enthusiasm. We also want to thank each of you for taking the time to go through all of the steps to enter! Since we all seem to share in a mutual admiration for Robert Siegel Handmade we will partner with him again in the future for another giveaway! Although we wanted to send vases to everyone who had expressed a deep love and heartfelt enthusiasm for them, we could only pull one name from the hat. That name is Iliana Macgrath! Congratulations Iliana! We asked Iliana if she wouldn't mind sending us a photo and a little bio about herself! Iliana McGrath is a marketing professional who spent over a decade working in the corporate world before taking time away to raise her two young children. As a native of Los Angeles, she takes every opportunity to enjoy the culture, beaches and mountains with her brood in tow. 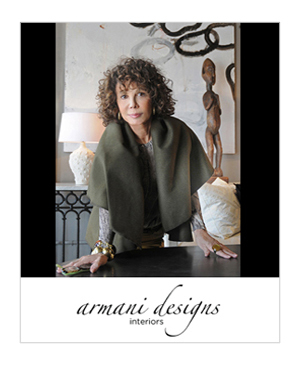 In her free time, she might be found creating jewelry, exploring home design or traveling. A special thank you to Robert Siegel and all of you who entered! It was very fun and we look forward to doing this again soon. I have mentioned how much I love summer so many times now that I'm starting to sound like I should relocate to a warm, beach side community! With only about 6 to 7 weeks left of summer in our mountain town I'm trying to finish my summer outdoor projects and still taking advantage of each sunny day. My projects this summer have included putting in a fountain, a stone patio and gardening. The wall garden shown above was easy install and I love the results! 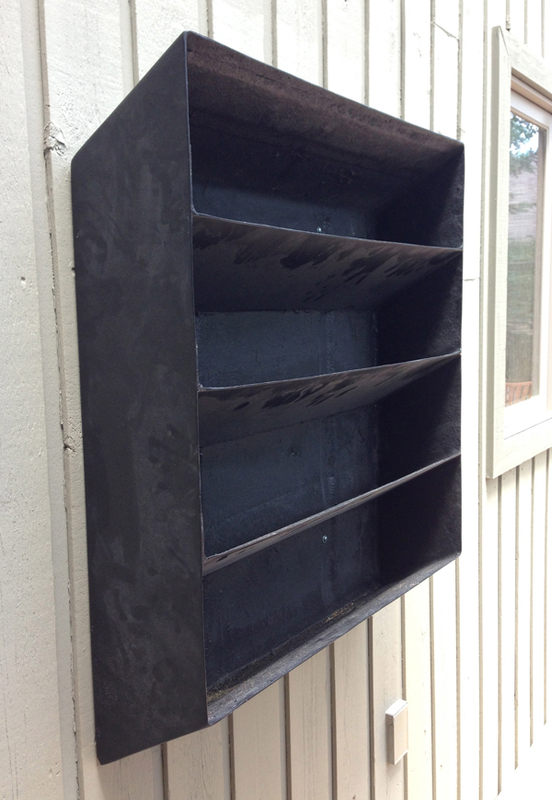 A friend gave me a black wall planter made of a hardy composite/fiberglass a few months ago. I hung it with heavy duty screws to the wall in my back patio and planned on using it for succulents that would require little water. I ended up changing my mind and planting an herb and veggie wall garden instead. I purchased mint, peppermint, marjoram, strawberries, cabbage and oregano in small containers and transferred them to larger containers. The shelves are on a slight slant and I can water directly into the planter or take the small pots out and water more thoroughly. I can now walk out my back door and easily harvest for salads, pasta, garnishes and more from my patio plus it looks great! P, I love this idea! How big is this box and can you move it inside for the winter? M, It is around 30" wide x 35" tall. It is a nice size for my smaller back patio wall. I don't think I will move it into the house but will cover the box and replant in the spring. I will experiment with more herbs next year. I loved the idea of planting strawberries so the vines would grow long at the bottom but so far they have not done as well as they usually do with a regular strawberry planter. But plenty of mint! There are so many things I could be writing about today but wanted to pause for a moment and share this unique home interior. For some reason, during the summer months I dream of a house with white floors, while linens, and a white kitchen. [ Perhaps I need a beach house!] I love how this designer has used white as the foundation to showcase her lovely handmade scarves and blankets. The blend of weathered objects mixed in with modern furnishings and accents gives this home a unique feel that is quite charming. I can imagine sitting in the ghost chairs at breakfast or snuggling into the linen bedding at the end of the day. P, there are so many things I love about this house! 4. Light filled rooms – nice when you can get it! M, I also love the pops of color in this white space like the yellow couch with the turquoise zigzag lamp as well as the scale of the handmade objects in this home. How unexpected and fun! Remember several years ago when we traveled to Maison d' Object–the international home decor show together and saw furniture, and rugs which were created with over sized knitting needles? I should try to dig up some of those photos to show at a later date. P, Lets go to that show again next year! Paris here we come! Thank you to Radostina at 79 ideas for sharing these lovely photographs with us.